This past Wednesday, John Boehner announced that he is suing the Barack Obama for abuse of powers and not faithfully executing the office of the Presidency. Many have inquired of late with regards to the Speaker of U.S. House of Representative's body language. At multiple times, Boehner's mouth rapidly and evanescently pulls up at both corners in what some novices mistake for disgust or regret - and still others confuse it with "duping delight" (Ekman). However this is a facial tic (particular image below is captured from 0:21). 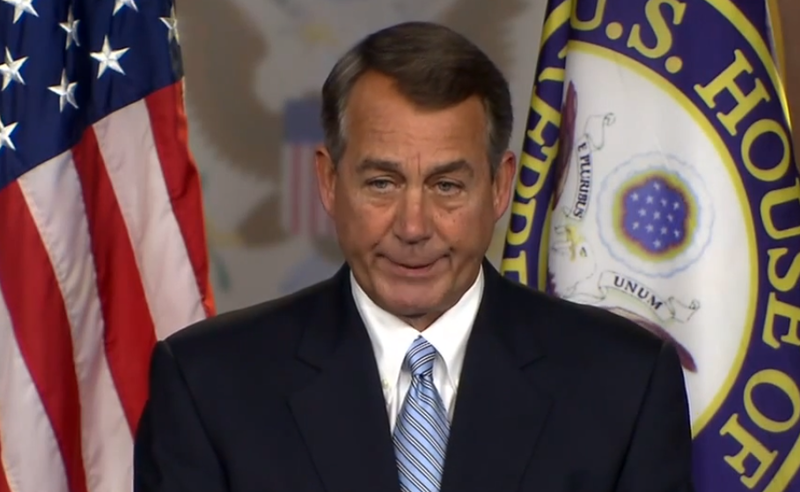 Mr. Boehner displays it often and it increases in frequency with his anxiety level. The presence of this facial tic makes other nonverbal signals (such as those associated with the emotions mentioned above) more difficult to discern. What other body language (e.g. non-tic facial expressions) in this video betray the Speaker's true thought-feelings with regards to suing the President?